Island Weddings Ibiza Crew: Our exclusive Interview with YolanCris & the IWICrew "10th year Anniversary"
Our exclusive Interview with YolanCris & the IWICrew "10th year Anniversary"
The crew of Island Weddings Ibiza is a hughe fan of haute couture designers YolanCris and between their very busy schedule and traveling from Paris to NY for the preview of their both collection: Bridal & Evening, they have found the time to have an exclusive interview with us. In 2005 both sisters decided to give rise to their dream by creating their brand turned towards natural and authentic women. 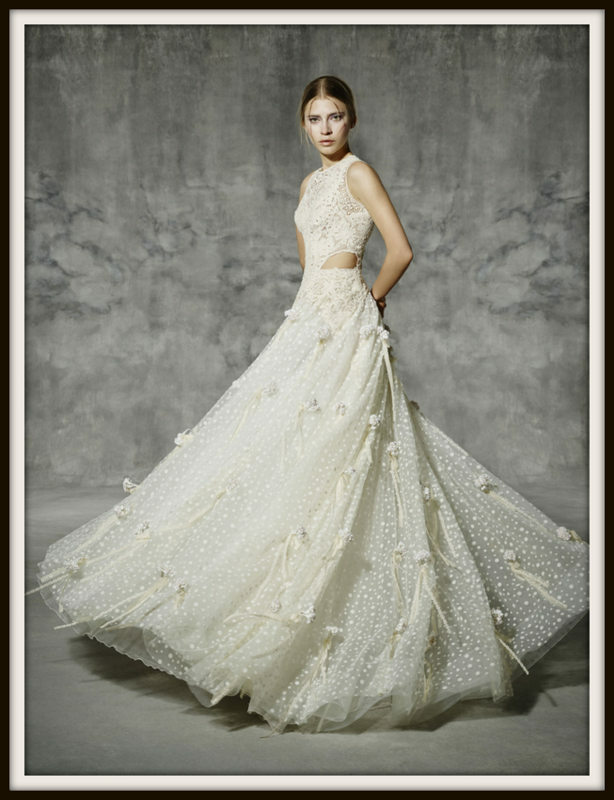 Since then, YolanCris succeeded to pull itself up as a brand of reference in the sector with an increasing national and international expansion . In 2006 they presented their first collection at Pasarela Gaudi Novias, during the Barcelona Bridal Week, nowadays, they are recognized as a leading brand in wedding dresses and evening wear worldwide. Their secret? Every design and YolanCris creation is hand-crafted in their Atelier of Barcelona, where are selected high quality European fabrics and every detail is studied minutely with passion. The fusion between a traditional sewing method and an innovative design closed to prêt-a-porter trends sign the magic success of these two sisters with constant and incomparable boiling talent! How did Yolanda and Christina start working together? Yolanda & Cristina (we are sisters) we were born with only 1 year of difference in age. All our lifetime we have been growing up, playing, being friends and now workmates. The interest felt by Yolanda and Cristina in haute couture and bridal fashion world is a family heritage, their mother, pioneer in bridal business, taught them since they were children the well-done work and how to feel the magic world of wedding dresses. How long are you working together now? This 2015 we are celebrating 10 years creating haute couture. Our atelier has the point of being a creative and innovative in design but it’s composed by best professionals in couture sector, with more than 35 years of experience. The way we create our gowns is based in antiques techniques of sewn and haute couture. Are you working together on one piece or do you have the same style but work on your “own” dress? We had very internalized the idea that from child on we are a team, the truth is that we were and we still are bound by love and mutual respect. Yolanda (older sister) manages the creative direction and designs all brand collections: bridal & evening wear. Cristina (little sister) is the managing director and CEO. We are the perfect team, creative & finances in a total equality. The new bridal collection 2016 is called Orchid. I suppose your inspiration for the dresses is all about the beautiful orchid flowers. How does this show in the design? We were celebrating our 10th Anniversary when someone very special for us give us away a very exquisite and rare Orchid. We feel captivated by it, completely bewitching! That’s why this new bridal collection takes the name of the most extraordinarily beautiful and unusual flower in the world, Orchid. A flower with a great beauty requires time of dedication, commitment and attention. Comparably, YolanCris creates its wedding dresses, and this hard work, care and design study summarizes a decade of constant creation and quality sewing. How would you describe the new collection? 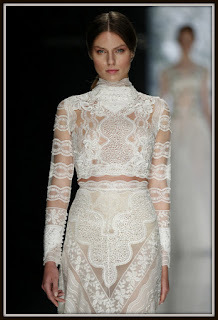 Is a collection very elaborated where brides could choose between a youthful line, very trendy what we called Boho Folk or a more sophisticated line as more romantic and based on haute couture, Romantic Lace line and Orchid Haute Couture. A prêt-a-couture line, with a base in fashion trends, casual and cool design. The bohemian chic line is where each design emanates freedom, but in a more mature, calm and natural way. Savoir-faire, chic essence where YolanCris ID is recognized at first sight. Boho folk understand as an iconic and timeless style, a trend for 2016. The folksy style bride is interpreted through the super position of different fabrics and original textures, creating a new world that draws a journey through different cultures. Contemporary silhouettes, modern, metropolitan style, generate energy and fresh dynamic silhouettes blouses and skirts. Craftsmanship of hand sewing with woven cotton guipure, linen thread rustic crochets and silk tulle wrapped in a journey toward a balanced synchronously artisan style. And another line we called Orchid Haute Couture. This time the journey is inward. The fineness and mysticism of the best European fabrics such as Chantilly lace, guipure silk, organza with hints of moharé mixing with classic fabrics such as silk tulle and fancy silver rhinestones forming floral patterns. 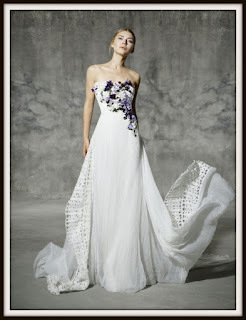 This particle line takes the name of the new bridal collection YolanCris called / ORCHID / the most extraordinarily beautiful and unusual flower in the world. A flower with a great beauty requires time of dedication, commitment and attention. YolanCris creates its wedding dresses, and this hard work, care and design study summarizes a decade of constant creation and quality sewing. Where do you get your inspiration from when you start to design a new collection? It can be anything. A travel, a movie, an art exposition, a woman personality, a street. a deep love for haute couture. 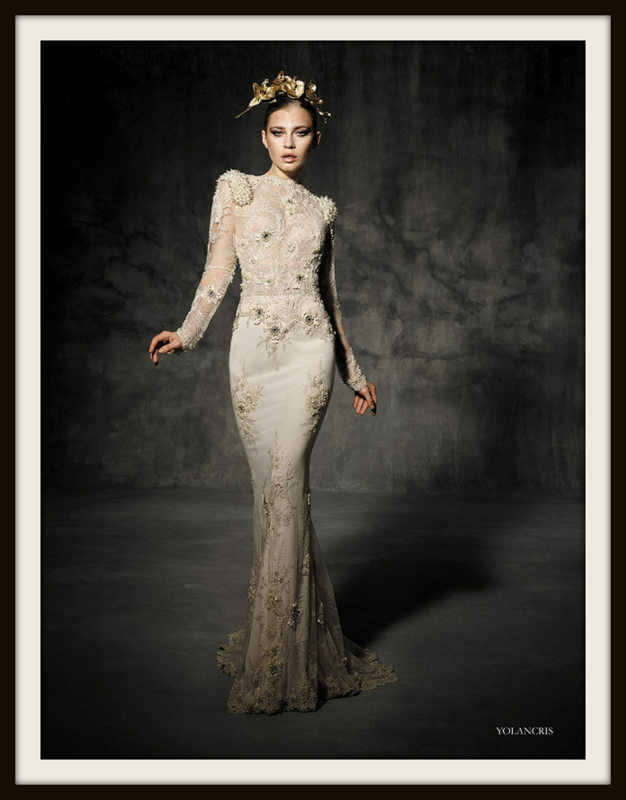 We often create each bridal collection with different lines for different styles of women. Each dress is identified with a part of ourselves and we love it when our brides tell us that her dress YolanCris, could be themselves on their wedding day. If we're talking about style and shapes, we definitely get inspired by the glamour and sophistication of old Hollywood stars of the 30s and 40s are a foundation of our creative inspiration, almost iconic in our collections. The quality of the designs and the fabrics used at that time to create unique dresses, it is very similar to the process that we use to create our gowns: one by one on the mannequin, with old techniques couture as moulage and hand sewing. That’s the reason why the vintage as a concept, its uniqueness, also a recurring inspiration in our collections. Because the quality of a product is timeless. And that will always be our fetish inspiration, creating couture dresses for women with a unique personal style. Whenever we talk about prints, laces drawings and concepts. We feel that nature is our main inspiration nowadays. Nature is in its form an extraordinary and complex structure and function, but itself is the culmination of beauty. We love nature drawings from modernism that used by craftsmen in Barcelona during modernism period. We grew up in in a very beautiful architectonics city, you only need to walk around any street of Barcelona to feel that time and it is inherent in our subconscious. We also love anything related to s.XIX: fashion, art, paintings. We enjoy a lot with deep study of design, pattern and seems. We’re focus on create a high quality product and the only way to achieve this goal is through hard work but showed with freshness, spontaneity, creativity and freedom. The new collection has just been launched, but do you already have ideas for the next collection? Yes of course, design implies never stop creating, your mind always is thinking about the collection. Anytime, anywhere. I know this is like this for at least all the main fine arts professionals: sculpture, painting even illustration, etc. Know we have finished establishing new trends and after brainstorming ideas created our mood board and sketchbook. We have been studying though pattern and atelier, new silhouettes and finding solutions with new concepts on mixing fabric and texture. Always trying to innovate and creating new concepts in bridal designs. How long does it take to create a new collection? Is quite different from ready-to-wear, as we often say: couture only needs one thing, and it’s time. Time for hand sewn and working with mastery and expertise. You have a haute couture line which is fabulous, but do you also have a pert-a-porter collection? It’s what we like to call prêt-à-couture is quite far from ready to wear understood as “fast fashion”, as every dress/ garments needs to be studied in different matters: design, pattern, construction and transmission of the idea, hand sewn and production. How do you choose all the different fabrics for the dresses? We are very fussy with fabrics. Very, very strict. We feel a real passion for them. We use exclusives fabrics created only for us based on the inspiration of each collection. Fabrics are the “philosopher’s stone” the base of the magic of real haute couture. How many shows do you present yearly? Is that for everybody available to join and see the show? We present the main bridal collection at Barcelona Bridal Week, once a year. We have reserved seats for all brides that write us asking that they love to be present and see the fashion show, but there are limited capacity. And then we present twice a year in New York our bridal collection and in Paris the prêt-à-couture collection and haute coture evening wear. Does the fashion show also goes abroad? Ibiza or to Holland? A fashion show is a thing that have to be done very professionally. Top models, best place, etc, so you can show your collection the way it should be. Yes we’re planning on show abroad but we haven’t decided the city yet. In Ibiza we have had several catwalks. You know we are in love of Ibiza, we have inspired several time on its folklore and culture, even one bridal collection in 2013 was called Ibiza! And was inspired by the light that bathes it. Boho chic trend was born there in early 1970. What would be your advice to woman who are seeking for their perfect wedding dress? We highly recommend her that she only has to be herself. The most important is to have the knowledge of how is her silhouette/neckline and what shape fits her best. But there’s something as important as that: is her wedding day, and she needs to be free to choose the style of wedding dress she always dreamed on. Sometimes is hard to know which wedding dress is the best for you, some brides are very confident with one determinate style, but some don’t. Just have fun trying on different shapes of dresses. Because we are very confident that quality is what marks the difference. Once you try on a YolanCris gown, you will notice that they are weightless, because we use natural eco-friendly fibres and a modern design will give you the confident to show your own personality, bespoke couture and tailored made will give you the comfort to enjoy of your dreamy day and make you shine! If the people in Holland want to buy your beautiful dresses where can they go to? In Netherlands we have beautiful stockists/ boutiques where brides-to-be can find YolanCris wedding dresses. What did we forgot to ask and both ladies want to say to our readers? We just want to say hello to your readers, and invite them to uncover our couture world! At www.yolancris.com or our feeds on social media! We will love to know their opinion and comments are really welcome! Thank you so much Ibiza wedding for this interview! A great pleasure! Island Weddings Ibiza would like to thank Yolanda & Christina for this great interview and the professional crew who has made this interview possible for us, Astrid & Silvia, Muchas gracias ! Are you inspired by YolanCris, please see below their social media networks and spread the word! !